Strips of pristine beaches, world-class diving, fine dining and knockout spa, Kuramathi Maldives is rated one of the best hotels in the Maldives and with good reason. Opening in 1975, Kuramathi became one of the first resorts in the country, it took 12 hours to get there by boat. Today, the transfer takes a 20-minute seaplane. Kuramathi has come a long way since those innovative days, from small coral huts and showers with salt water, and although each new transformation had its purpose, this last one, in my opinion, is by far the best. What used to be one island with three resorts of different standards, is now one of the largest hotels of the highest quality. 3 resorts remained, today they are updated and modernized, with the numbers of 10 categories scattered throughout the island. The middle part of the island is the place where most of the rooms of the highest category are located, and here you will find a lot of favorite amenities. Accessible by speedboat or seaplane, this huge resort is located on an island a mile long in Rasdhul Atoll. Kuramathi is one of the largest in the Maldives with 290 accommodation units. Famous highlights of Kuramathi Maldives include two separate diving centers, a spa, a kids' club, hidden beach areas and stunning house reef snorkeling. Modern, if slightly simple, villas with thatched roofs have a patio; Some of them are equipped with hydromassage bathtubs, tropical showers in the open air, private swimming pools or above-water facilities. Updates in 2015 added several new types of rooms with a modern design. The basic all-inclusive rates include drinks and meals in one of the three main buffet restaurants, while Select also includes meals in nine a la carte restaurants. We also recommend comparing prices with Kuredu Island Resort & Spa, a large all-inclusive resort complex with many free services. 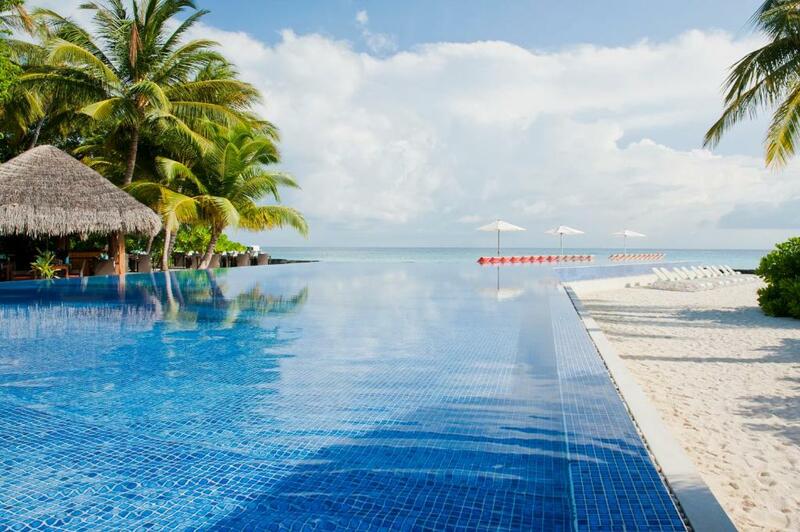 Kuramathi Maldives is one of eight resorts run by the local brand Universal Enterprises, and due to its remote location the average length of stay for guests is 10 nights. Guests get to the island by seaplane for 20 minutes, or a speedboat trip for 90 minutes. Newcomers are greeted by attentive staff, seated in a modern reception area, offered a welcome drink and cool towel, and then given an intro to the resort before being transported to their rooms in various parts of the island. 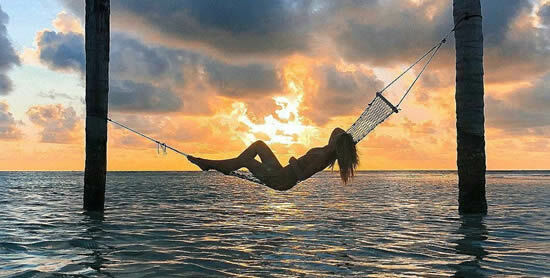 The island is long and tapered, stretching a mile from the infinity pool in the east to a stunning sand bar in the west. But since this is one and the same place, it is very pleasant to move between your favorite places to eat, sunbathe, drink, play and enjoy. Because it is a large and very puffy-green island, it never seems crowded, even in peak seasons (since people discovered the new Kuramathi). The narrow, upper part of the island is a quiet area, with a sandbank ideal for watching the sunsets, Serenade Jetty and a great The Reef restaurant. The rooms in this part of the resort now have the most affordable rates. The middle area is the smartest, with a spa, a children's club, a large swimming pool, a water sports center and a some restaurants. And the island's wide lower part that used to be the village, still remains an exciting, active and accessible end. Nevertheless, there are several more top-accomodation here, and the new center is truly fantastic. Separate from the old main bar - chic Sand bar and island barbecue are located around a large swimming pool. Everything is beautifully conceived and presented. What was one of the first in the country Bio Stations resort, is now a very impressive, award-winning Eco Center, with a resident marine biologist and a gardener. This is a place where every guest will want to visit again, and from various lectures and demonstrations, learn about environmentally friendly projects or sign up for a snorkelling lesson or a nature tour. 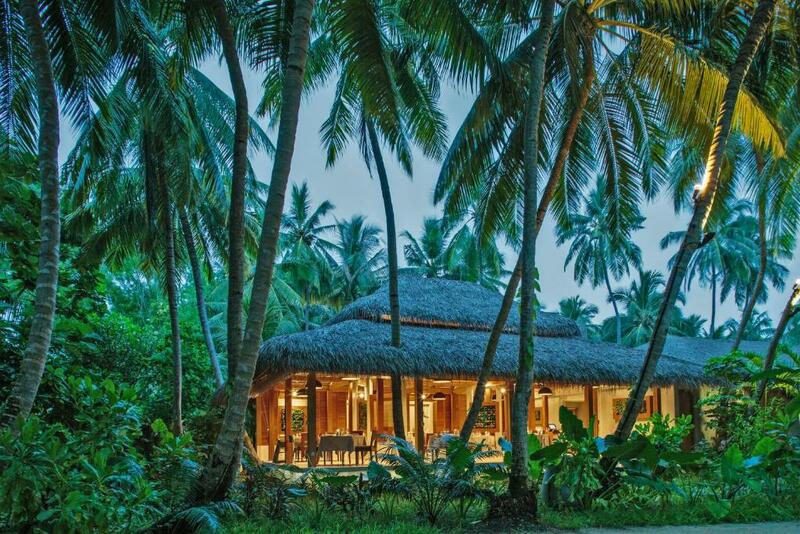 The center on the island develops the best initiatives in the country, and guests at Kuramathi can be proud of this. Most guests spend their day lounging in a beach chair and taking regular trips to the house reef, that is one of the resort's major draws, offering sightings of reef sharks, turtles, rays and lots of other marine life. At sunset hours, many trek over to the sand bar with camera in hand. Since restaurants are spread out, the atmosphere at night is quiet many are on the basic all-inclusive plan (covering meals at a designated buffet restaurant) and pay separately for the a la carte restaurants, where reservations are required. Evening entertainment varies at three bars, and a DJ spins at the disco, though there often are only a few guests on the dance floor. As at many resorts in the Maldives, guests tend to hit the hay early and wake up for sunrise instead of partying the night away. Kuramathi is located in Rasdhoo Atoll (administratively North Ari Atoll), a tiny atoll with 5 islands. After baggage claim at Velana international airport, guests head to Universal's main kiosk in the airport for their transfer. Unlike other resorts which require either boat or seaplane transportation, Kuramathi's location is able to offer both options. Those looking to save some pennies will choose speedboat, which takes 90 minutes, though conditions can be bumpy and the layout of the boat may have guests awkwardly facing each other for a long ride (returning staff members sit in the lower deck). 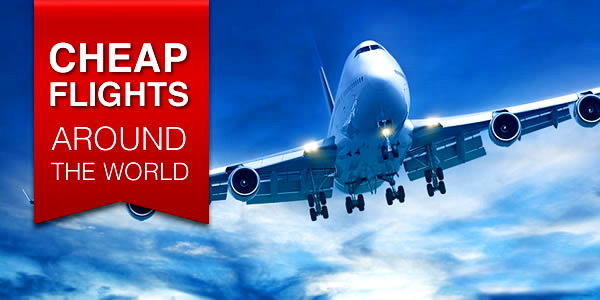 The seaplane option will cost more, but the experience is worth considering for the convenience, comfort, and views. Guests are taken to the private lounge with refreshments and bathrooms before departure. The plane ride takes about 20 minutes and provides beautiful views of the Indian Ocean dotted with white islands. Guests jump off at a platform and then are transported to the resort's jetty by dhoni boat. Make the right choice - this is the number you want, based on its type, price and location. In 10 accommodation categories different rates for 4 different types of rooms: Honeymoon (Pool Villa and Beach Villa), Water Villa, Beach Villa and Garden Villa. Each room has the same facilities and amenities, except that the top-2 category also has a Nespresso machine. What is the difference between a room, except a jacuzzi or not, this is their size, age, layout and location. These categories are very carefully and competently calibrated. You will not make a terrible mistake, because the rooms look different, and you can always ask to move to another place. Critically, 3 'zones' still have different environments. All 290 rooms are assigned to the villas and all boast clean, but simple, modern furnishings: artificial wood or white tiled floors, white bedding with dark pink curtains, photos of fish in a frame (but little or no other artwork), and a some rooms have vaulted wooden ceilings. The villas feature king-size beds with canopies, flat-screen TVs, DVD players, iPod docks, speakers, minibars and free coffee, tea and drinking water. Spacious bathrooms (most of them open-air, but not all) have rain showers, bathrobes and basic toiletries (no hair conditioner!). In separate patios there are two chaise lounges (some also have couches) and different types depending on the type of room; All rooms have easy access to a clean beach thanks to the island's long form. 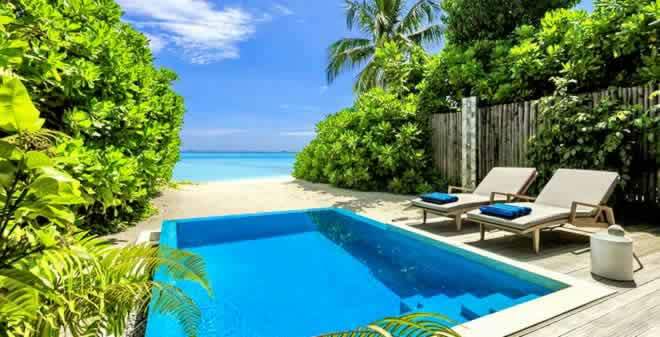 Beach Villas offer the cheapest accommodation and are located along the resort's lagoon. Beach Villa with Jacuzzi is a good option for couples, with covered and open couches and overhead hydro massage baths (the water will change as often as the guest likes). Superior Beach Villas with Jacuzzi have a round shape, a large wooden deck and a spacious bathroom with an open bathroom with a hot tub. Deluxe Beach Villas with Jacuzzi are located in the center of the island, in close proximity to the best beaches. These rooms also have beds and Nespresso machines. Water Villas with Jacuzzi are built on stilts over the water, next to a house reef for easy access to snorkeling from private sundecks. (Although the neighbors are not visible, the villas are close together, so neighbors are often heard.) The layout is large and open, and each block has a large bathroom and a two-level terrace with a hydromassage bath, two sun loungers, and an umbrella. Honeymoon Pool Villa is the largest and most luxurious accomodation with a separate bedroom, living room and dining area. Outside there is a closed terrace with a large open bathroom with a shower and a hot tub. A highlight, however, is a private small pool that is romantically lit at night. 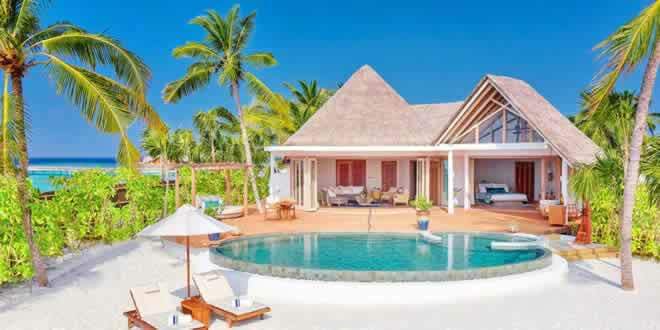 Reconstruction in 2015 added several new types of rooms: Two-Bedroom Beach House, Deluxe Water Villa, Water Villa with Pool, Sunset Pool Villas and Sunset Water Villa with Pool. These rooms have more modern decor elements, such as abstract wall sculptures and futuristic furniture. As it happens on long islands, the best beaches sparkle at each end with some pockets and bulges of sand on each side. The quality of the sand is excellent. 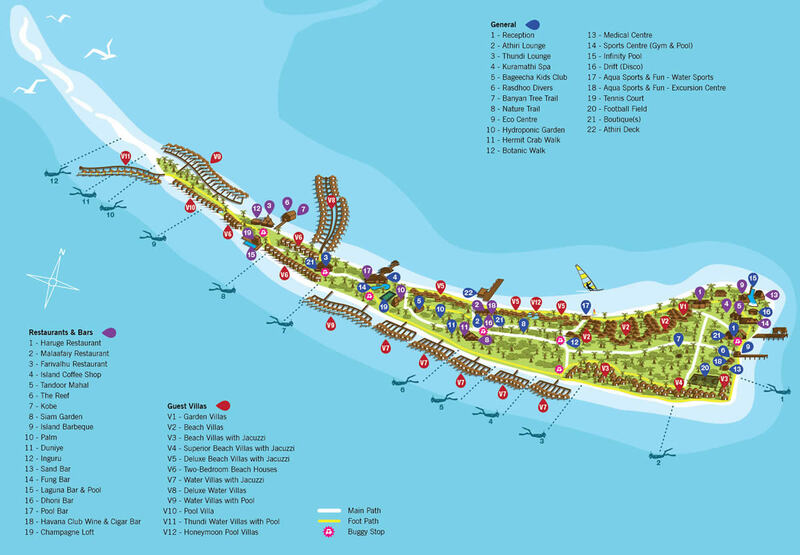 Despite the number of rooms, guests will still find plenty of beach space, and most guests adhere to the spot closest to their villas. Couples looking for solitude can find hidden, quieter areas located among the palms, especially at the western end. Two outdoor pools include one family pool with fresh water in the spa and a fitness center with a children's area and a swimming pool by the ocean near the Fung bar. Although children are welcome here, the infinity pool, as a rule, attracts mainly couples. The whole resort has been re-imagined and the new product is top class. At the same time, the essentials are all still here. Diving is a big draw. There are many fine, varied sites, from thilas to channels, corners, inside and outside reefs. Mantas visit in the winter and the great all-year attraction is the hammerhead shark point. The personnel at the dive base, Rasdhoo Divers, couldn’t be more friendly and accommodating. Renting snorkel gear is highly recommended (and free to use with all-inclusive rates) and the house reef is one of the best in the Maldives. Guided excursions and safaris are available a good idea for first-timers to the island; guests can then explore on their own with confidence. 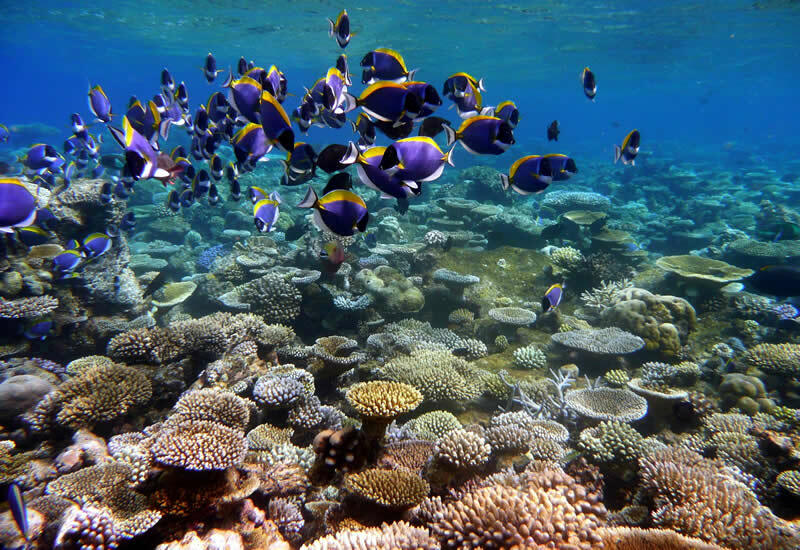 Marine life is in abundance here with consistent sightings of manta rays, parrotfish, butterflyfish, moray eels, Portuguese Man o' Wars, sea turtles, and harmless reef sharks, to name a few. The medical center is the best in this area and has the largest decompression chamber in the Maldives. It is equipped to handle major problems with diving or other emergencies. In addition to the hyperbaric chamber, the Medical Center is also equipped with modern diagnostic devices for ECG, radiography, blood analysis and audiometry. It includes a small room with two beds. Two German doctors, a diving officer and a specialist in general practice work all year round. The Kuramathi's cusine used to be one of its weaker sides, but today it's already a forgotten story. Buffets are very good, there are a lot of specialized outlets, and there are also many positive reviews about the quality of food. Each guest takes either a full board or all inclusive options. There are two all-inclusive options: the Basic package, which covers all meals at one of three buffet restaurants as well as premium alcoholic and non-alcoholic drinks, and the Select package, which also allows guests to dine at the nine a la carte restaurants (bookings are required). This upgrade also includes certain bottled wines. Children under six are not allowed in many of the a la carte restaurants, so couples rather than families tend to choose the Select package. 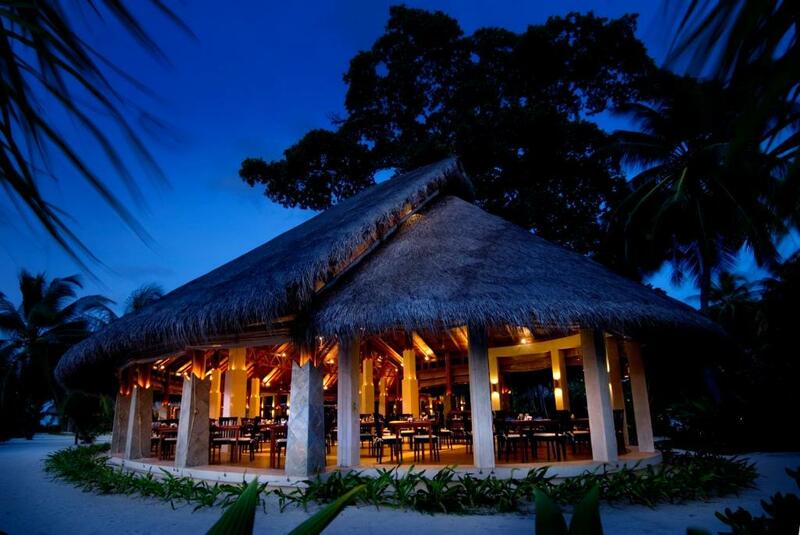 Three main buffet restaurants: Haruge, Malaafaiy and Farivalhu are located in different parts of the island and serve guests with breakfast, lunch and dinner; Guests are assigned a number based on their category and location. Breakfast includes cereals, fresh bakery and bread, fruits, juices and live cooking stations for eggs, waffles and pancakes. For lunch, there are many hot and cold dishes, salads and mouth-watering sandwiches, and dinners are changed regularly with culinary themes from around the world. The Reef, restored in 2015 serves fresh seafood in overwater setting. Tandoor Mahal is an Indian restaurant for lovers of tandoori and curry. 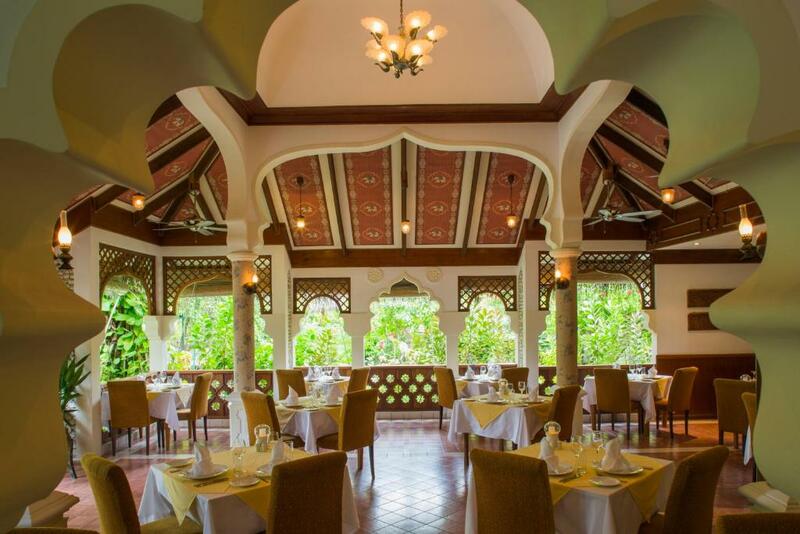 Siam Garden - all about Thai cuisine from four regions of the Kingdom. Island Barbeque is next to an infinity pool with feet in the sand and quality meat cooked to order. The Palm restaurant serves Mediterranean cuisine, such as pizza, pasta and salads, and at night becomes very romantic. In Duniye you will find the best wine map on the island, which perfectly complements continental snacks and main dishes. Two new restaurants, Kobe and Inguru, serving teppanyaki and Asian fusion cuisine, respectively, were added to the Kuramati culinary scene in 2015. When you come to restaurants, the dress code requires men to wear at least a T-shirt, shorts and ladies must wear something covering their body (long t-shirts or sarong / dress). In short - anything you like - just not in swimsuits. Six bars scattered around the island offer cocktails, evening entertainment, and nightly happy hours. Fung Bar is the biggest and most popular bar, next to the infinity pool, with all-day drinks served either under shade or on the beach. Fung Bar turns into a disco at night, though not many partake in dancing. Havana Club Wine & Cigar Bar offers cigars and spirits from around the world, as well as a few snacks. Karoake is also available certain nights. Cocktail garnishes, fruits, and leafy greens are often home-grown from the island’s own hydroponic garden. Perhaps what defines Kuramathi just like everyone else is the liveliness of the evenings. On a large mature island such as this one, you can always stay away from action, but when and if you want it, you will be very cheerful. If you do not know what is in one center, you can take buggies, listen, dance or watch the action in another. This is one of the best places to listen to good Maldivian and international singers. There are regular night entertainment, including discos, DJs, live music, solo vocal or duet, movie nights and karaoke. There are two options ALL INCLUSIVE: Basic package, which covers all meals in one of the three buffet restaurants, as well as premium alcoholic and non-alcoholic drinks; and the 'The Select' package, which also allows guests to eat in nine a-la-carte restaurants (reservation required). This update also includes bottled wines. Children under the age of six are not allowed in many a la carte restaurants, so couples, rather than families, prefer to select the Select package. Aqua Sports & Fun is the water sports center for windsurfing, catamaran sailing, and kayaking, and lessons are available for all levels (ages eight and up). Speedboat activities include waterskiing, wakeboarding, and banana boat rides, though jet skis are not offered in order to keep noise pollution to a minimum. Two fully equipped PADI dive centers guarantee that everyone on the island can partake in small group trips with attentive instructors. On the island there is a marine biologist who teaches guests about proper etiquette regarding contact with marine life. The spa has 13 treatment rooms for body and facial treatments, as well as nail services. The majority of rooms (indoor and outdoor) are designed for couples. European beauty products and natural essential oils are used. Other activities around the island include a large fitness center (though with no views), badminton, tennis, and an Eco Centre with an entire sperm whale specimen on display. Bageecha Kids’ Club is available for ages three to 12 between 8:30 a.m. and 5 p.m. There are two playrooms, an entertainment room, a dining room and an outdoor playground. Activities include nature walks, treasure hunts, beach activities, and pool time. A few shops near the reception sell sundries, underwater cameras, beach wear, jewelry and souvenirs. A medical center is available for any emergencies. Wi-Fi is offered, but this service may be unreliable. Guests may also have to log in frequently. 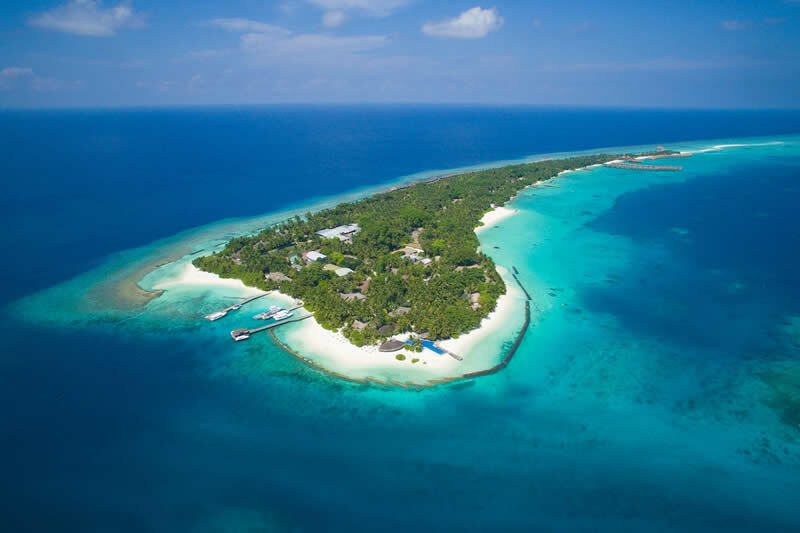 Reviews of the Kuramathi Island Resort are very good, with an unusually small number of complaints, which is very good and encouraging for a resort of this size. Most were extremely happy with the island, the rooms, the food, and all the activities available. Most guests on the all-inclusive meal plans were also very happy with the broad range of things included. In addition, many feel that the resort prices, including the nightly room rates are well worth it, which is a very promising sign. One minor complaint that a few expressed was that one small edge of the island directly faces an inhabited nearby island, which detracts from the isolated paradise feeling. Still, for a reasonably priced 4-star resort with this many rooms, the track record is very impressive, making this a solid choice, especially for families. In order to protect the privacy of our guests and team members, as well as for their safety, we do not allow the operation of drones within the resort premises, unless explicitly authorized and supervised by the resort.